If you struggle to keep to a diet, planning your meals with a food diary might help. There are hundreds of productivity apps to help you organise your life, but Calorie Counter and MyPlate are specialist tools in this area, containing food diaries to help plan meals and record what you’ve eaten. 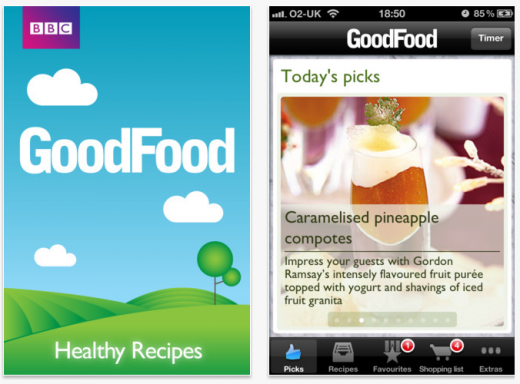 If you don’t want to live off salad, take inspiration from recipe apps such as Good Food Healthy Recipes or Epicurious. 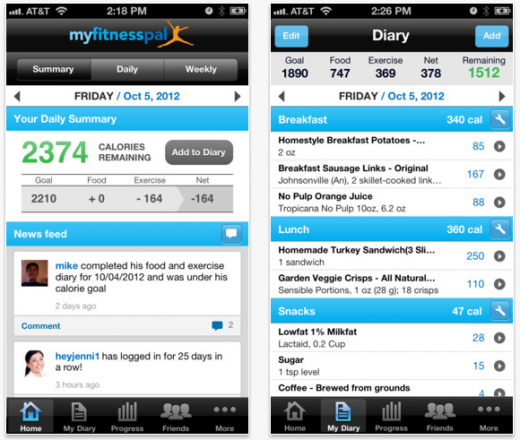 Work out how many calories you eat with this top app. Claiming to have the largest library of any diet tracking app (with over 2 million foods), you can either look up meals, manually scan barcodes, or best of all, enter your own recipes to calculate their nutritional content. 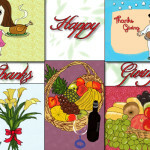 Its an Free ipad app using which, you can set yourself diet goals, and Calorie Counter will help you stick to them. For the most accurate reading, you can also log your exersices( with many in-app to try) and workout how many calories you burn. You don’t have to go it alone when you’re dieting, and many groups, like Weight Watchers, offer companion apps to help you shift the pounds. 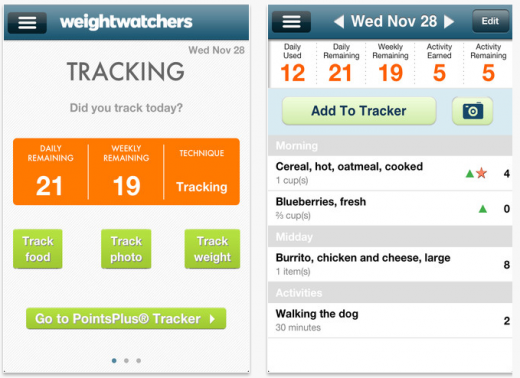 As well as being able to Search for your nearest group, Weight Watchers Mobile is updated daily with a featured healthy recipe, weight-loss tips and motivational stories.The main feature relates to the Weight Watchers PointsPlus dieting system, allowing users to calculate how many points your food is worth and track how many points they eat in a day. When you’re on a diet, it can sometimes be difficult to see a noticeable change in your physical appearance even if the scales show that you have lost a few pounds. Body Compare stores photos of you over the course of your diet so you can look back at what size you were when you started out, and compare it with how you look after a few weeks. 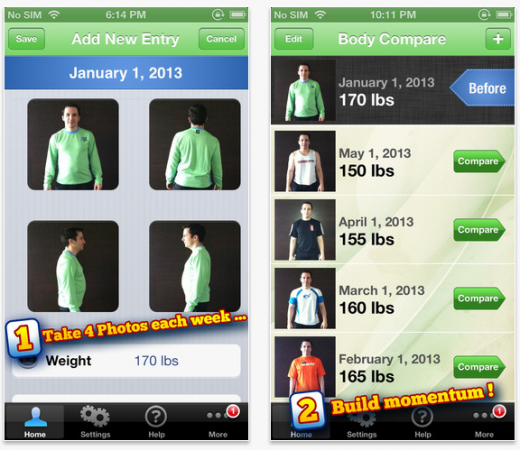 Each photo is tagged with your current weight and you can look at them side by side for easy comparison. 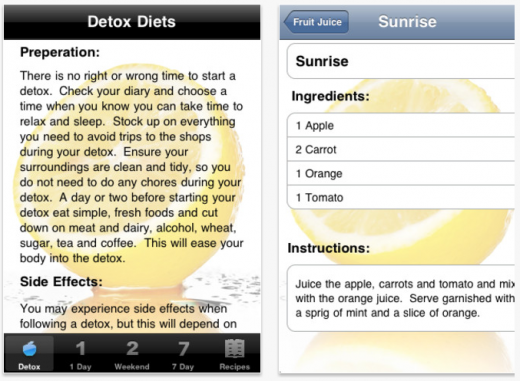 The Detox diet & Recipes app contains three detox diets, a one-day mono diet, a weekend diet and a seven-day diet. Packaged in a simple interface, this app gives detailed information on each detox, including what should be done before, during and after each cleanse. If you’re not sure what you can and cannot eat, the app also has a recipes section containing 18 detox recipes split into recipe types of vegetable juices, fruit juices, soups, salads and mains. 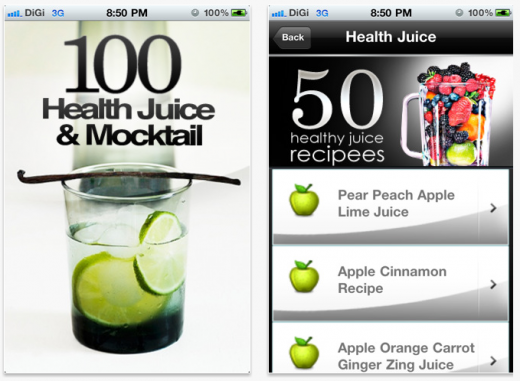 If your looking to eat healthier and lay off the booze, try 100 Health juice & Mocktails. Led with beautiful photography of each drink, the prospect of drinking liquidized vegetables will seem a lot more palatable after five minutes viewing this app. 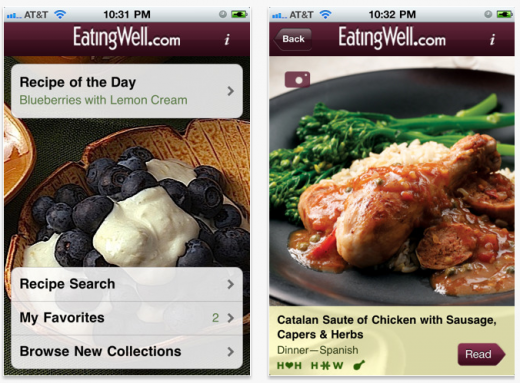 Rather annoyingly, while the iphone version is a free download, all of recipes are behind a $1.99 pay wall. The Android version on the other hand is up front about the cost, and is also cheaper. Once you do get full access, the app also lacks a search function, so you have to sort through recipes manually. Containing 300 recipes, covering all your main meals plus snack options, Detox Diet+ is a comprehensive cookbook for purifying your body. 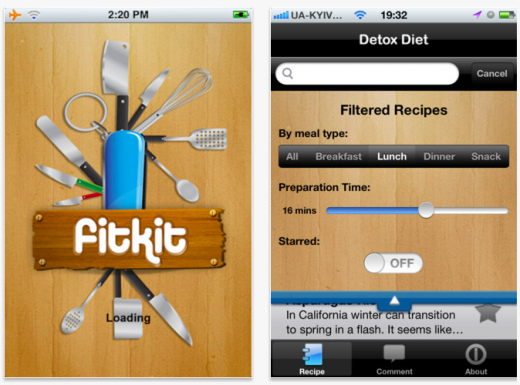 To make your detox easier, the filter menu allow you to find recipes easily. searching by breakfast, lunch and dinner, and how long it takes to prepare. Once you’ve found one you like you can star it to add to your favourites. Set in a stylish chopping board UI with bright photography, this app looks great. 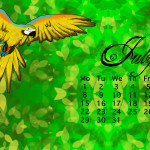 However, to actually make use of it you need constant internet access, as all the recipes are stubs for external links. When you’re shopping or out for a meal, it’s not always easy to figure out whether you’ve chosen a healthy dish from the packaging alone. 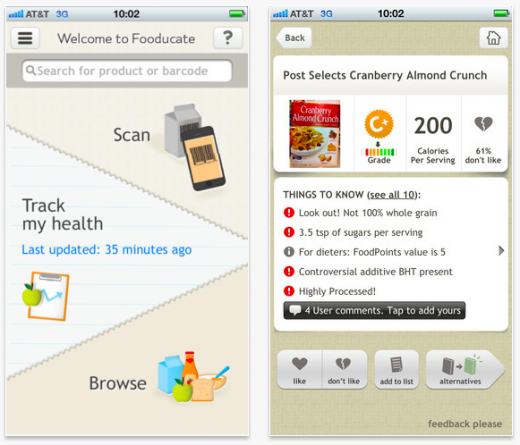 Look up your favourite foods or scan their barcodes using Fooducate for a full breakdown of their nutritional content. This app has a database of over 200,000 items to help you select healthier foodstuff, and also allows you to track your daily calorie intake. Forget takeaways or ready meals, there is nothing healthier than home cooking. Free of E numbers or additives, you are also able to control how much sugar or fat goes into your dish. But where to start? Good Food Healthy Recipes has 195 ideas with step-by-step guides, and allows you to filter your search by recipe name, course, or ingredients, so you can search by what you have. Vegetarian options are included, as are recipes with fewer than 200 calories. Many complain they don’t have the time to cook, whereas fast food is just that – fast. This app from the popular magazine and website, www.eatingwell.com, promises that none of their dishes takes longer than 45 minutes. lf you’re in a rush, filter this app’s 200 recipes by main ingredients so you can use what you have at hand, or by the time it would take to make. Despite emphasising speed, this freemium app offers an impressively diverse selection of world cuisine.